The Uncrushable Rose is a moving and heart-rending memoir—the story of a girl born in 1939 to a Chinese diplomat in Saigon (now Ho Chi Minh City), Vietnam. Author Bambi Shen offers vivid memories of the concentration camps she lived in during the five-year Japanese occupation of then Indochina, in World War II. Her memoir also paints a clear picture of the mother/daughter conflict predictable in a culturally patriarchal society and male-dominated family system. It is a story of challenge and survival, and of the struggle to be freed from the limitations of centuries-old tradition and cultural boundaries. 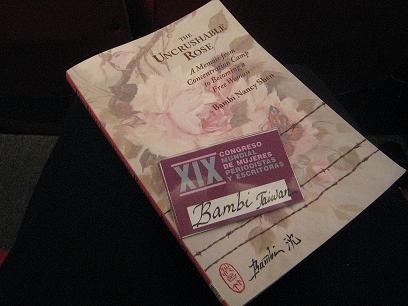 Bambi’s story is that of a Chinese woman with boldness and spiritual strength gained from her Catholic education, along with her understanding of Unity theology and of Buddhist and Confucian ethics. She has beautifully articulated her compelling life journey, filled with lessons learned through experience, bringing her to long sought-after self-empowerment and freedom. In the way she lives her daily life, Bambi herself demonstrates the interconnectedness of humankind and the opportunity for each of us to grow, to serve society, and to participate in the healing of our world. This is exemplified in the fact that, despite extreme differences with her mother, she spent years caring for her until her death. Bambi’s memoir demonstrates that even under the most difficult circumstances anyone can find countless ways to engage in the world to be a beneficial presence. Bambi Shen is a true model to give us lessons in action, involvement, and support for the creation of a peaceful global community.